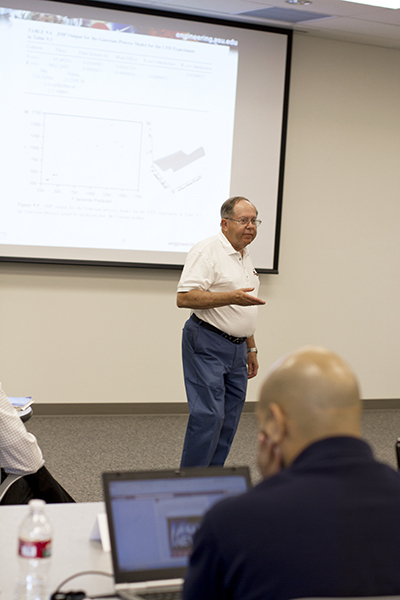 Regents’ Professor Douglas Montgomery leads a class in the Master Black Belt certification program. Nine business professionals recently completed the Master Black Belt (MBB) program at ASU, putting them a step closer to achieving the Master Black Belt certification. In the final step of the program, candidates will submit a white paper outlining how Six Sigma will be deployed within their organizations. The hybrid program combined intensive classroom training at ASU’s Interdisciplinary Science and Technology Building 4 (ISTB4) with online resource courses to deliver a unique educational experience. The Master Black Belt certification program began with a five-day class formatted to include lecture, discussion, activities and student presentations. Classes were instructed by one of ASU’s three Master Black Belt instructing faculty: Regents’ Professor Douglas Montgomery, and professors Connie Borror and Alberto Filjardo. Following the class, participants completed five online courses that served as resources for demonstrating their knowledge of key concepts by completing their white paper. The participants learned technical principles, emerging technologies and information that benefits a career and a company. With the help of their training, they now understand the mathematical theory on which these statistical methods are based, and how to apply these methods in unusual situations. The Six Sigma Master Black Belt Certification provides participants with the knowledge and resources to represent and wield the technical leadership of the Six Sigma program. Six Sigma is a systematic approach that promotes continual improvement of important processes in various industrial environments. It was developed by Motorola in 1985 and is used by such industries as banks, manufacturing facilities and hospitals. The Master Black Belt is the highest ranking in the Six Sigma program. The Ira A. Fulton Schools of Engineering Office of Global Outreach and Extended Education (GOEE) administers the MBB program, one of many short courses and professional development programs aimed at helping engineers professionals advance in the workforce.